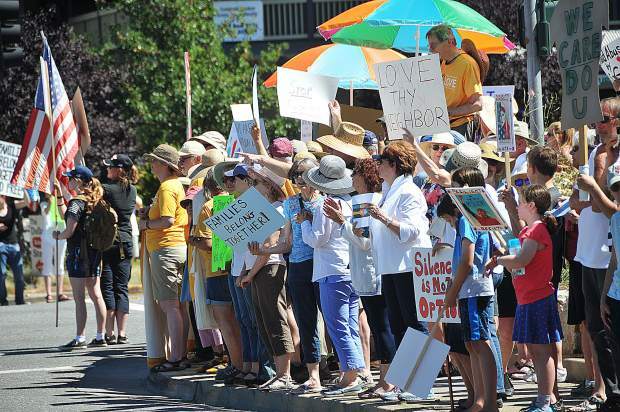 Hundreds of protesters — sharing many different ideologies — took to the streets of Grass Valley Saturday morning to exercise their first amendment rights of the freedom of speech at the intersection of Brunswick and Sutton Avenue in the Glenbrook Basin. 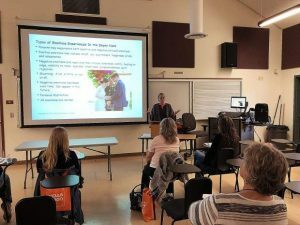 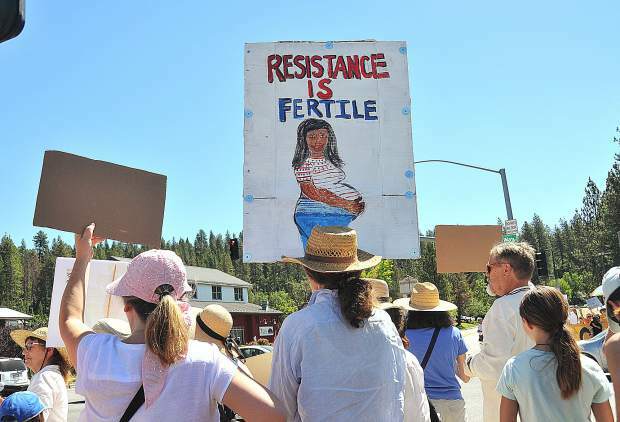 The signs of those attending the families belong together rally, ran the gamut including build the wall, we are all immigrants, and resistance is fertile, displayed at the corner of Brunswick and Sutton in Grass Valley Saturday morning. 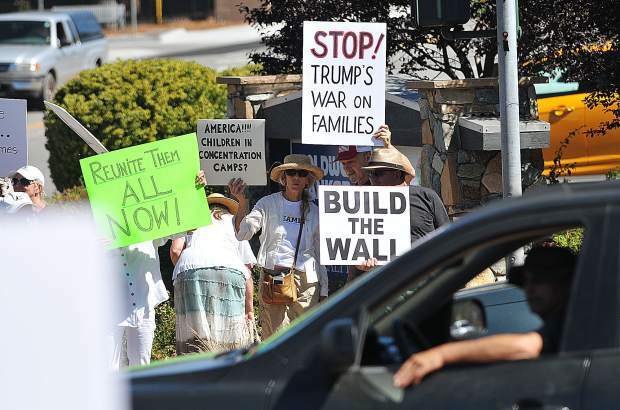 A driver inspects the multitude of signs and protesters at the intersection of Brunswick and Sutton Avenue Saturday morning. 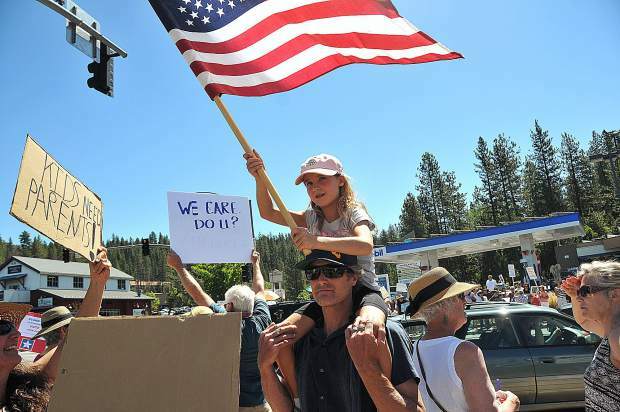 A young patriot and her father proudly display the United States flag during Saturday morning's rally. 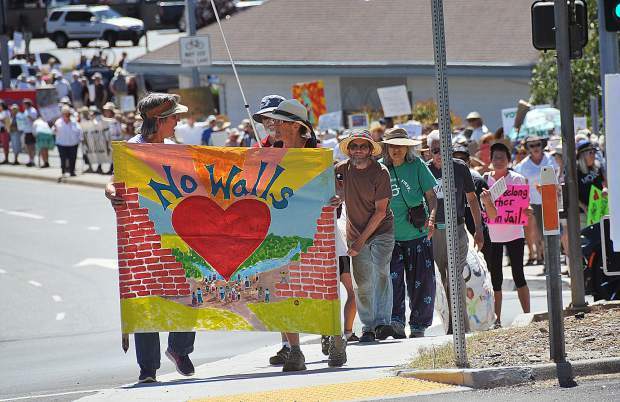 Brunswick Avenue became a dividing line between protesters wanting to build the wall, and between others wanting families to belong together during Saturday morning's protests. 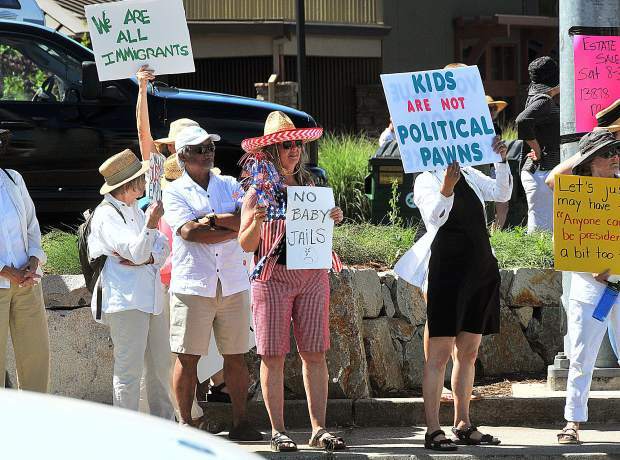 What was initially billed as a rally to support keeping families together at the intersection of Brunswick and Sutton Avenue Saturday morning, quickly became an opportunity for a counter protest to take place with folks holding signs to build the wall and to deport illegal immigrants. 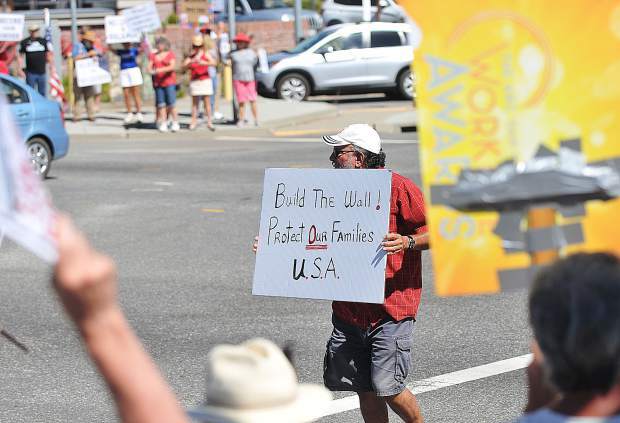 Roughly 500 peaceful protesters took to the intersection of Brunswick and Sutton Avenue Saturday morning, eventually marching to the Brunswick overpass where drivers along Highway 49 could see them. 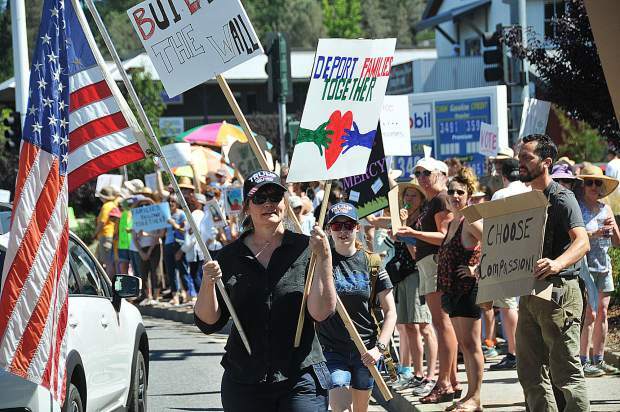 Brunswick Avenue was lined with more folks protesting for families to remain united rather than those wanting to build the wall along the southern border with Mexico during Saturday's Families Belong Together Rally in Grass Valley. 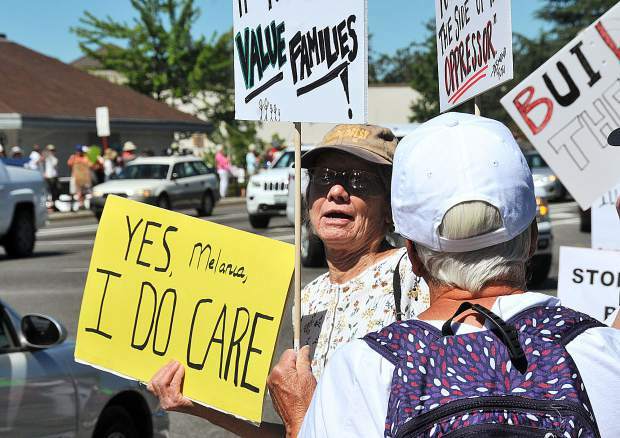 A woman holds a sign that reads, 'Yes Melania I do care' during Saturday's demonstrations at the intersection of Brunswick and Sutton Avenue. Roughly 500 protesters were estimated to have taken part in Saturday's demonstrations at the intersection of Brunswick and Sutton Avenue. 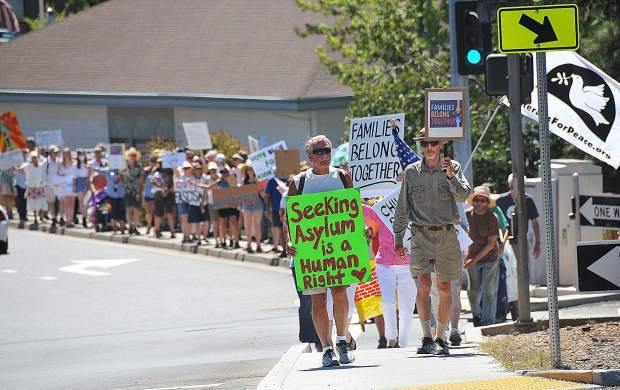 The line of peaceful protesters in favor of keeping families together and safe asylum, reached along the Brunswick Avenue sidewalk between the overpass and Sutton Avenue. 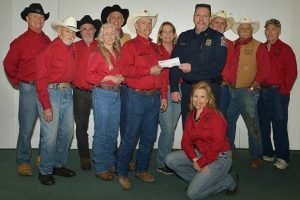 Protesters of clashing ideologies taunt one another during Saturday's protest which remained peaceful at the intersection of Brunswick and Sutton Avenue. 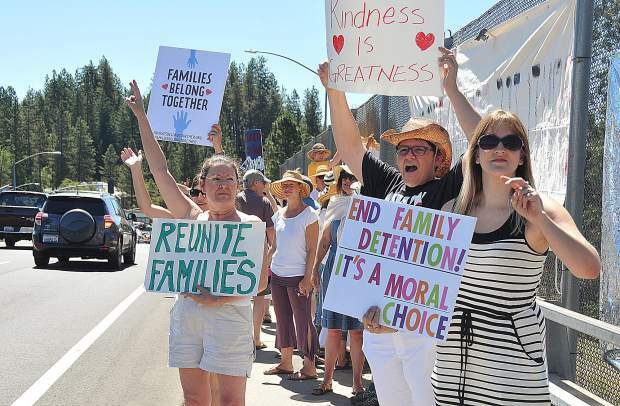 What began as Grass Valley’s voice in the nationwide ‘Families Belong Together’ rally, quickly turned into an opportunity for a contingent of counter protesters to take to the streets opposite the large crowd with signs reading ‘Build the wall’, and ‘Deport Families Together’ Saturday at the intersection of Brunswick Road and Sutton Way in the Glenbrook Basin. 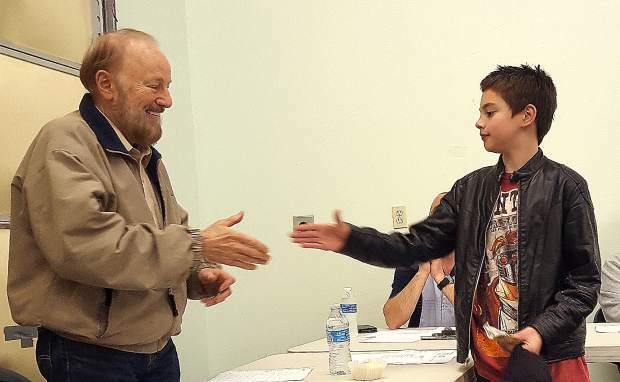 While the majority of the protest and counterprotest remained civil, there were tense moments where members of each faction stood face to face as they exchanged words with each other. 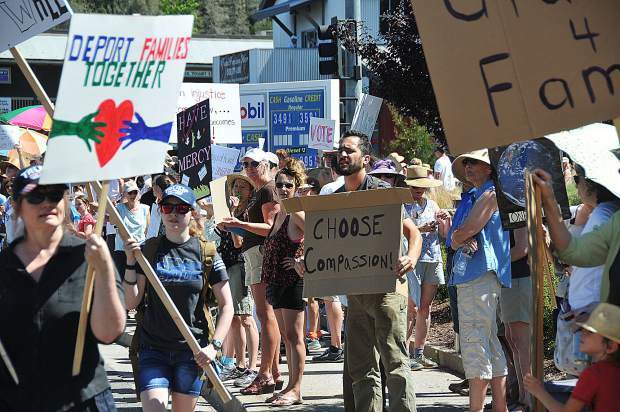 More than 650 events across the United States took place Saturday morning with the common theme to reverse the Trump administration’s separation of families seeking to enter the U.S.